Step into your own bliss through the sacred teachings of Yoga and Ayurveda within the beauty of one of my favorite places! Nosara, Costa Rica. Enjoy yoga, meditation, learning and adventure! Have you been dreaming of a tropical and peaceful getaway? Are you looking to bring deeper meaning and cultivate a feeling of richness in your life? Then this is the experience for you. Every retreat is a transformational experience, it’s a vacation yes, but a sublime inner experience as well. Join me as we delve into the sacred teachings of yoga, ayurveda and tantra to unlock the realization that Sri – the divine source of all life – bestows beauty, joy and prosperity. To explore and experience the teachings in practice, there will be two classes daily which will feature yoga, meditation and/or learning sessions. Schedule will allow for free time to explore the beauty and adventure of Nosara and surrounding beaches and destinations. Our retreat sanctuary will provide 3 vegetarian meals per day with an option of chicken or fish at lunch and dinner. The resort concierge can arrange activities and transportation to and from the airport upon arrival/departure. Did I mention that this resort is a 10 min walk to one of the best surf beaches in world? 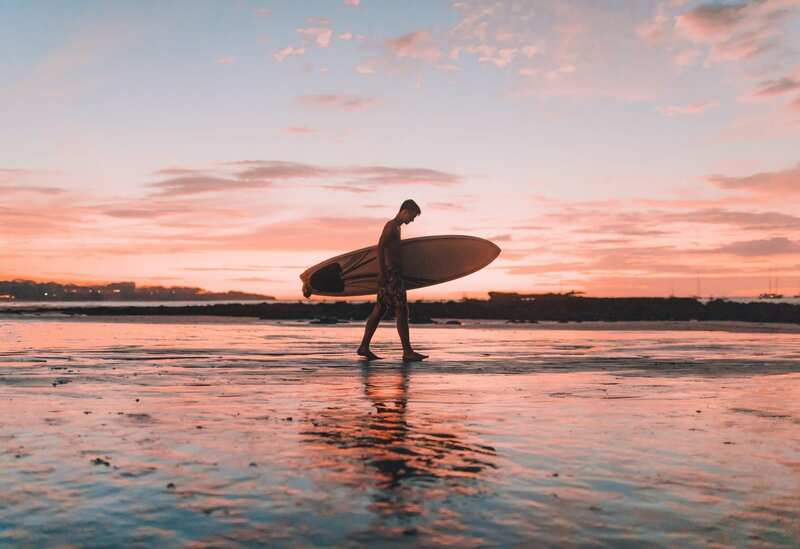 The 3 mile stretch of Playa Guiones not only has some of the best surf year round –but the evenings sunsets are unparalleled in ease and beauty. The water is warm and healing! Please, absolutely join us – you don’t want to miss this amazing experience with a group of like-minded, fun, dynamic people! Keely Totten is a Los Angeles based yoga teacher and dedicated student. Through a clear and practical approach, Keely specializes in guiding students on their own journey toward inner joy, freedom, self-healing and spiritual growth. Keely has trained in Hatha Yoga, Tantra and Ayurveda. Her teaching style is inspired by alignment-based Hatha Yoga, Para Yoga, and the therapeutic approach of Structural Yoga Therapy. She was initiated into the Sri Vidya Tradition in 2014 and continues to study with her teacher, Yogarupa Rod Stryker, in the well-respected Para Yoga Master Training Program. Additionally, Keely currently studies Clinical Ayurvedic Medicine at the California College of Ayurveda. Keely works privately in Sierra Madre, CA and offers retreats and workshops. When she’s not teaching or studying, you can find Keely enjoying a hike on the trail, traveling with her family, having good laughs with friends, and finding reasons to be grateful for the miracle of life.